Want to #LiveBold? Try some Adventure! Having the courage to live our best lives shouldn’t remain a fleeting aspirational thought, it should be what gets you out of bed in the morning and what makes you take the risks that make all the difference! This week, we’re taking a closer look at some bracing adventures you could dive into that will add some more bold in your life. The best bit, it’s really good for you. Numerous studies show that adventures have a positive impact on your whole body. Physical and mental activities that stretch and excite us result in an increase in endorphins and a strengthening in our hippocampus. That keeps us sharper, improves our happiness levels and increases our blood flow which rejuvenates our system; basically it makes us healthier and keeps us young (who wouldn’t want that!). Oh, and being adventurous obviously makes us look cool. So what are you waiting for? We’ve even split the list up into different levels so you can find the right amount of adventure for you! I’m dipping my toe in the water…..
Test your mental agility at an Escape Room or all of your skills ‘Crystal Maze’ style at Jumble. Both places offer a chance to flex your brain power, work as a team and think outside the box (in more ways than one!). It’s a very refreshingly exciting experience that will show you how fun it can be to try new things. Just watch who you go with, the competition could make everyone a little crazy! 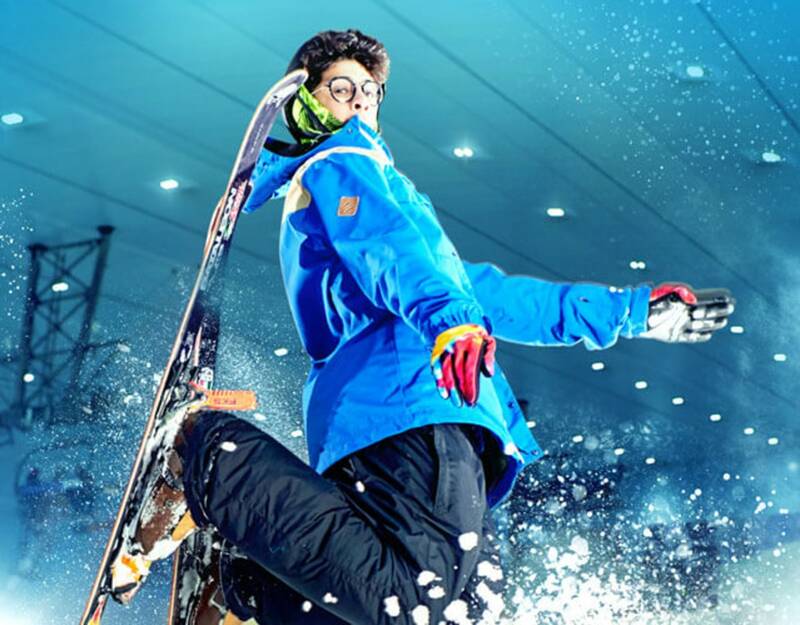 Get cool on the indoor slopes of Ski Dubai. With all the changes there over the last few years, you might have missed just how much there is to do, for people of all ages and capabilities. From penguin bonding experiences to zorbing, there are lots of new experiences to be had, all at -4°; and, of course, you can try your hand at skiing or snowboarder courtesy of one of the qualified instructors. If you are already a bit of a pro, try signing up for one of their ‘Jump Nights’! Discover why all those Americans care so much about the Second Amendment with a session in the gun range at Sharjah Golf and Shooting Club. With expert instructors you can try your hand at a variety of weapons, including a Berretta, Glock and an M16, all in a safe, controlled environment. You might be surprised at how much you like it! Experience 5G forces in an F1 passenger ride. It might be at the more expensive end of the spectrum, but when you are streaming around the Yas Marina track at speeds of up to 300kph in a specially converted two-seater Formula 1 car, you’ll know it was worth every dirham. Just don’t try it on Sheikh Zayed Road! Transform your idea of a comfort zone with a cave diving trip. It’s time for a trip to Oman that doesn’t include a stop at the Chedi. Instead, gear up for a visit to Hoti Cave, east of Al Hamra, which comes with its own underwater lake. You’ll be amazed at what you see and what you discover about yourself. 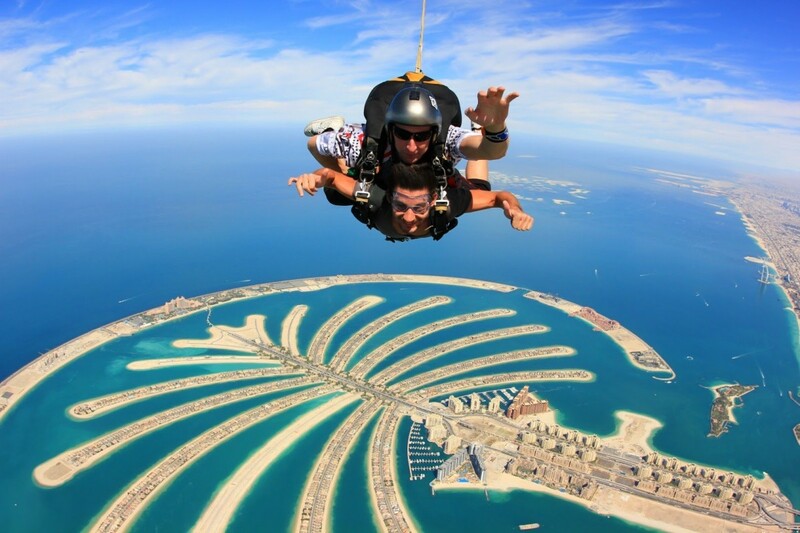 It’s a classic for a reason, but if you want to have a life-changing adventure, why not try Sky Diving over the Palm. This is an experience that will push you in every way and give you a memory you will never forget. Plus, how amazing would your new profile picture be? Thrill-seekers of all stripes can’t afford to miss the world’s longest Zip Line at Jebel Jais in Ras Al Khaimah. This bucket list must-do will have you travelling at speeds of up to 150kph at over 1,680 metres above sea level. You will feel like you are flying. How about becoming a human sling-shot? Yes, you did read that correctly. In their ever-increasing effort to make us all more adventurous, XDubai have opened their latest attraction at Kite Beach and it is an adrenaline pumper. After being suspended 4m in the air, you will be pulled 40m back and launched at 4Gs, with a speed up to 100 km/hr across the sand. It doesn’t get much more extraordinary than that. So, whatever you have planned for this month, try to make sure it includes a little more adventure; we promise it will be transformational. Don’t ever be afraid to #LiveBold.